Hey! Have you try Blindfold Hunt before? Imagine you're blindfolded and only guided through the voice by your BFF to pick up exact products according to the list given. On top of that both of you have to complete all the tasks in 5 minutes. Omg… the feeling of excitement, stress and yes… lots of fun just exploded. 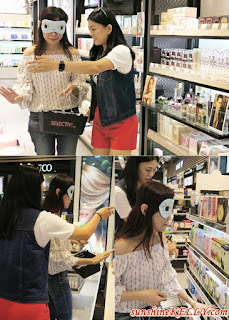 It was my first time playing the The Blindfold Hunt at Selectiv’ by Sa Sa, Mid Valley Megamall during their BFF Day. Tadah!!! there were 40 pairs of bffs together with Sa Sa Malaysia’s customers and few bloggers at BFF Day The Blindfold Hunt on Saturday morning. I paired with Mandy. I can imagine the excitement and stress Mandy had to go through when she was blindfolded and there were quite a numbers of corners she has to turn at the same time listen to my direction. Overall it was a really fun experience and I don’t mind play it again but this time I would like to be blindfolded so that I can feel it. After The Blindfold Hunt we check out some of the special promotions. In conjunction with the new Selectiv’ by Sa Sa opening at Mid Valley Megamall there are a lot of in store promotions going. Such as the Buy 1 Free 1, RM1 for the Best Selling Mask and some special items are on 70% discounts. It's time to stock-up your beauty products and get the grab the bargains from now till 25th Sept, 2016 at Selectiv’ by Sa Sa, Lot F-071, First Floor, Mid Valley Megamall. Hahaha. This looks really cute! Blindfold hunt, what a cute campaign! Did you win much Kelly? you looks so cute dear. how is the experience? Great activities. I am sure you have so much fun seeing them struggling to find the goodies. You both looks so pretty and seems to be having lot's of fun! Hahaha, I wouldn't mind being the blindfolded one and to be guided for the challenge! Seems like a fun challenge! such a fun event! Blindfold hunt.. do you win much? Hope they do it again and i can join! seems interesting. i think my buddy will enjoy this! :) such a good promo. Have not heard about this hunt before but it sounded fun. Am sure it wouldn't be so to a real visual-impaired person.